Region of North Eastern Aegean Islands, Prefecture of Mytilini (Lesbos), Province of Ikaria. Administratively Ikaria is divided into three municipalities, the Municipality of Agios Kirikos which is the capital and the south port of the island, the Municipality of Evdilos where is the north port is located, and the municipality of Raches which is in the central-west part of the island. Banks are located in Agios Kirikos and Evdilos and are open from 8:00am - 2:30 pm Monday-Thursday and 8:00am - 2:00pm on Friday. Almost all of the major hotels, travel agencies and car rental agencies accept credit and debit cards, but credit cards are not yet universally accepted in Ikaria, especially in smaller villages. For accommodations, transportation, restaurants, cafes, bars, shops, tickets and tourist services, all taxes and tips are included in the stated price and printed on the receipt. At restaurants, bars and cafes customers are free to roundup the bill amount and leave a modest extra tip, as a sign of satisfaction, typically not more than 5-10%. While it is not required nor expected by staff, it is appreciated as wages in Ikaria are low by European standards. Ikaria's official language is Greek. Public and tourist services, accommodation and transportation providers and shops,/businesses in Ikaria generally also speak English. For people, who are not from the EU or a Schengenland country, a visa is required. People planning to visit Greece who are not EU citizens should contact their consulate or embassy for visa information and requirements. Check the official Greek Ministry of Foreign Affairs for the "List of Countries" that require visas and for the countries that do not. Ikaria uses the European standard 220/240 Volts and 50 hertz for electrical devices. Outlets accept plugs that are the 2 pronged elongated European-style. The country code for Greece is 30 and the area code for Ikaria is 22750. To call abroad while in Ikaria or Greece dial + or 00 and then the country code you want and the local number. To dial a local number while in Ikaria use the prefix 22750 and then the local number. Ikaria is covered by 3 mobile phone networks which all use the European GSM standard and are 3G for data in most areas. Inexpensive pay as you go SIM cards can be bought in Ikaria. Greece and Ikaria are (GMT+2) during the winter months of October - March and (GMT +3) during the summer months of March - October. The country observes Day Light Savings Time. Public services and banks in Ikaria are generally open from 07:30 or 08:00 to 14:00 or 14:30. Businesses generally operate Monday, Wednesday and Saturday from 9:00 or 10:00 to 15:30 and Tuesday-Thursday - Friday from 09:00 or 10:00 to 14:00 and again in the evening from 17:30 to 21:00. During the summer season many tourism related businesses have extended hours to serve the needs of visitors. In the village of Christos-Rachon, store owners keep unusual hours and open late in the evening and close late at night or even early morning hours the next day. "Icarus Festival for the Dialogue between Cultures" at various locations around the island during the summer. Music Festival of Youth of Agios Kirikos in August at various locations around the island. Sport Club "Pramnos", Sport Club "Ikaros", Sport Club "Diagoras"
Summer school holidays in Ikaria are typically from the end of June until around September, and for 15 days around Christmas and Greek Orthodox Easter. Around the middle of the 19th century Epameinondas Stamatiadis (Ikarika, Samos 1893) reports: "The Ikarians are great friends of the feasts, gathering everywhere there might be a feast of some Saint or any church celebrating, for the first because of their piety, for the second to financially help the celebrating church." Today Ikarian Panagiria (religious feasts) take place generally during spring and summer months with the feast of Agios Isidoros (14th May) at Pezi - Agios Isidoros being the first and the feast of Ayia Sofia at Monokabi (17 September) the last. The "Panagiria" always feature homemade Ikarian food and especially roast goat and other meats, lots of Ikarian wine, live music, continuous dancing, and in general fun and revelry for all ages. These events start around midday and go on until the next morning! Amongst the so-called big and small feasts that would take place during these months, it is worth mentioning in particular the ones taking place at the villages of Mavrato, Panagia, Langada, Agios Ioannis in Christos-Rachon, Nelia, Akamatra, Karavostamo and Profit Ilias. The two most important dates for Ikarian Panagiria are the feast days taking place in multiple villages around the island on August 6th and August 15th. In almost all the villages of Ikaria feast day celebrations are organized on their respective protector saint's feast day. Ikarian "Pangiria" are very fun and popular events with people coming from around Greece and even from abroad just to attend one. The "Panagiria" also have an important social dimension, since apart from their entertainment side, they have as a major goal to contribute financial support to the local village/community and church. 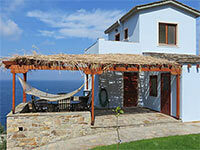 Ikaria has a generally pleasant climate all year round with over 300 days of sunshine each year. Summers are dry and warm with July and August being the hottest months with average daily high & low temperatures of around 32 °C & 22 °C. December and January are the rainiest months and in June, July and August rain rarely occurs. In August the seasonal "Meltemi" northerly winds blow and cool the island. These winds are especially felt on the south side of the island, while on the north side of the island they can bring large seas. The main hospital of Ikaria is located in Agios Kirikos. The hospital is in general fully staffed and equipped to handle most medical emergencies, although serious cases are sometimes airlifted to neighboring Samos or even to Athens depending on the circumstances. There are also medical clinics located in Evdilos and Christos-Raches and pharmacies located throughout the island. A network of private doctors specializing in various fields of medicine also practice in Ikaria. European Union (EU) citizens can provide their European Health Insurance Card (EHIC) or European Health Card (EHIC) for possible reimbursement of medical expenses in Ikaria. Non-EU citizens should check with their insurance provider before travelling to Greece/Ikaria to see what their coverage is iand should consider buying additional travel/medical/accident insurance before coming to Greece. Randi Forest, Drakanon Fortress, Mt. Atheras (alt 1,040m) (Pramnos) and the Halaris River Canyon have been included in the European network "NATURA 2000". Ikaria has also been declared an Important Bird Area. Local and regional conservation and research is actively carried out by Archipelagos which also has a satellite office in Ikaria. Ikaria's thermal springs are located mainly on the island's SE coast. The springs at Therma's coast were known since antiquity. They belong to the category of radioactive springs. The unique therapeutic qualities of their water made the island famous. During the 1920s an extended exploitation of the thermal springs began and until the 1940s many hotels were built and business connected to the operation of baths flourished. During World War II and the Civil War the springs stopped being operated. In more recent years efforts to revitalize therapeutic tourism have been made and the qualities of the curative springs have been officially acknowledged and scientifically categorized. 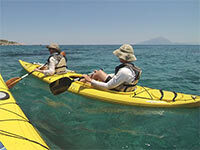 Many of the species of fauna and flora common in the islands of the area are located on Ikaria. Concerning flora, especially in the island's south, where great lime rocks can be found, some of the more endemic (unique in the world) species and subspecies can be seen, such as: the Paeonia mascula cariensis and the unique species Iberis runemarkii, that grows in only a few places worldwide. Other important flora sites can be found at Faros or along the river Chalaris, which flows year round towards the north. Reptile fauna is of Asia Minor origin in general. Along with the samiamidi Mediterranean Gecko lizard (Hemidactylus turcicus) the ophisops snake eyed lizard (Lacertidae Lacertinae) snake and the Starred Agama (Laudakia stellio) etc. can be seen, whereas the so-called lizard of Ikaria (Lacerta oerizeni) is found only here. The most common snakes are the ephios (Coluber juguralis) and the sapites (Malpolon monsessulanus); none of the island's snakes are poisonous. On the coasts many bird species nest, amongst which some rare ones like the wild seagull, the sea raven, or the birds of prey Bonelli's eagle (Hieraatus fasciatus), the peregrine falcon (Falco peregrinus), the golden falcon (Falco biarmicus) etc. There are also three protected species of bat: the Rhinolofus mehelyi, the Myotis blythi and Myotis myotis. Endangered species such as the Mediterranean seal, the bottlenose dolphin (Tursiops truncates) and the striped dolphin (Stenella coeruleoalba) find shelter in the waters around Ikaria. The island is called Nikaria by its inhabitants. In antiquity it was called Makris or Doliche, due to its elongated form. It is also referred as Ichthyosesa, due to the rich fish populations in the Ikarian Sea and, like other islands, Anemoessa, due to the strong winds blowing there. The name Ikaros and Ikaria was given later and it is related to the famous myth of Icarus. Some believe that the name is of Phoenician origin, but, as the geographers of antiquity had already noted, Ikaria's name is connected to the Myth of Icarus and this remains the most plausible theory. According to the mythological tradition Icarus, ignoring his father, Daedalus's, advice, after escaping their imprisonment in Crete, flew very high, resulting in melting his wax feathers, falling and droning in the sea just off the coast of an island. According to tradition his father buried his body at the island and and named it Ikaria to honor and immortalize his son. Today that spot where Icarus fell is called "The Rock Of Icarus" and is marked by a large boulder in the sea just off of the coast. The dialect of Ikaria is unique and has been researched and reported on by the well known Greek linguist G. Chatzidakes (1848-1941). Chatzidakes visited the island in the summer of 1891 and two years later published his study in a German scientific magazine. His work has been translated in Greek and published under the title "On the Dialect of Ikaria". A dictionary of original Ikarian words and phrases has also been published by Mr. Dimitris Lesses. Ikaria lies in the N.E Aegean Sea between Samos, which is 10 nautical miles to the NW, and Mykonos, which is 26 miles to the E. Ikaria is 56 miles south of Chios and 143 miles from Piraeus harbour. It is one of the bigger islands of the North Eastern Aegean; its coastline spans 102 miles (160 km) and the whole island covers 255 square miles (660 square km). It has an elongated shape with a perimeter of 50 miles. It stretches from NE to SE and it is almost entirely covered by the mountain Atheras (ancient Pramnos), with its highest peak being Melissa (1040 meters). This mountain ridge crossing the whole length of the island ends up in steep slopes towards the south, while towards the north it creates the only plain areas at Kambos and Faros. The island has the form of an overturned ship, as the 15th-century traveler Buondelmondi properly observed. Geologically Ikaria is exclusively comprised of crystalloid schist metamorphic rocks (i.e. gneiss with mica schist, marbles and sipolines). It is believed that these rocks are of pre-Devonian age and that the island belongs to the nucleus of the Lydian-Carian crystalline core, connecting, along with Samos, this mass with the Cyclades (or the South Aegean). On the island in general and more specifically in the area of Agios Kirikos iron ores have been located, which were exploited in earlier times. Ikaria is noted for its steep geographical relief of mountainous character and many ravines, plateaus and basins, which played a major role in the development of human activities. The coastline presents a small horizontal division with very few gulfs and offers no significant anchorages and natural harbors. The most important open gulfs are the ones at Agriomelissa and Ayios Nikolaos to the south near cape Papas. The climate is considered to be mild. Regularly a lot of rainfall occurs in the winter period, favoring the development of rich vegetation. 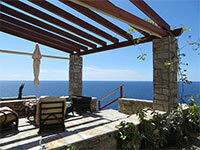 Ikaria is one of more green and rich in water islands of the Archipelago. In former times there were extensive ancient forests covering the island, of which today remains only the EU protected Randi Forest. As it lies between Mykonos and Samos, Ikaria has common attributes with the Cyclades, as well with the islands of the East Aegean. It also has some unique characteristics. Ikaria along with Fournoi islands have been incorporated in the EU's Natura 2000 network for the preservation of natural environments, due to its great bio-habitats diversity. When looking at Ikaria's houses, villages, settlements and traditional architecture its evident why Ikaria is indeed peculiar and even unique in the whole Aegean. Settlements on the island are scattered, non-densely built and disproportionately dispersed in comparison to the population. Usually in the islands and their mountain regions settlements and villages are densely built and the people's cultivated lands are generally outside the residential areas. Things in Ikaria are totally different. Houses, or "spitokathismata" (house-seats) as they are usually called, are built inside their cultivated lands, so villages become a complex of local private farms. This unique feature is due to the fact that the defense of Ikaria in former times was based not on the clustering of houses and their fortification but on their camouflage and remoteness - i.e. the two rules for the construction of Ikarian houses and the development of its dispersed and remote settlements and villages. By studying the evolution of the Ikarian house and local architecture we actually study the Ikarians' course in history especially after the Byzantine period and until the early 20th century. Concerning the style of Ikarian houses and the development of its villages three major eras are distinguishable: the period of obscurity, the 19th century and the first half of the 20th century. The first and totally original type of house in Ikaria is the "kamares" (vaults), built inside rocks or louroi (huge granite rocks). Because of the geomorphology of the island they were developed on the west part of Ikaria with the settlements at Ellinika (Mavri), at Karkinagri area, Vrakades and others being the most characteristic ones. Almost the whole village consists of such kamares. The locals call these types of houses "theoktista" or "katoikitiria". Kamares and louroi can be seen at Magganitis and Pezi. Some kamares still preserve the name of gerodokamara, originating from the tradition of the harsh years of obscurity for the old people (geroi) to move into these places in order to leave more desirable living space for their children. The "chyto" is a kind of a one-room house of small dimensions. It was the most common type of dwelling until the early 19th century, remaining in use in a smaller scale and with minor variations until the 20th century. It is one of the so-called "anti-pirate" houses and it formed the nucleus of the defense. As time went by it evolved, acquiring various additions. Anti-pirate houses had a wall built, something like a bench, in front of their entrance leading to the "chostokeli" (semi-subterranean space mainly in eastern Ikaria) or "kryfokelia" (away from the house and under the yard walls, mainly in the western parts). The houses in Raches, Feidos, Kamba and Koumaro south of Pezi are characteristic of this type. As time went by and dangers became rare these hideouts were used as auxiliary rooms. In the beginning of the 19th century there was no longer any danger from piracy. This change is marked by the appearance of new types of complex dwellings and the parallel condensation of the villages and new communal organization. Ikaria's society started presenting the first openings. A new kind of dwelling appeared, the two-room, two-storey house with the name pyrgos or pyrgami, with a second floor used as a guesthouse. According to the tradition around the late 18th century Ikaria was settled by people from Mani and, since pyrgoi, as well as the new settlements have common attributes to similar houses in Mani, it is believed that the new inhabitants introduced this architecture. Successively the pyrgos was combined with the chyto, creating various types of mixed two-storey or more complex dwellings. The upper floors (doma), however, were to house the guests, whereas the Ikarian family continued to live in the house's nucleus, the chyto altogether. Until 1930 the Ikarians avoided living in coastal settlements following their traditional way of life in the mountains. Change only came around the middle of the 19th century because of the expansion of trade and local seamanship. The old capital of Maratho was replaced by the new one, Agios Kirikos, which, in 1841, had just 20 houses. During the end of the 19th century the inhabitants' living standard improved markedly. In many areas such as (Ayios Kyrikos, Evdilo, Christo Rachon etc.) new houses appear, houses of a complex, multi-room plan and shape, mainly with a second floor, capable of housing visitors and offering every comfort essential to assure the social status of their inhabitants. Architectural models from other Aegean islands and Asia Minor are imported (balconies, friezes, cornices etc.). The four-sided roof is also introduced. The study of architecture once again reveals the image we have for the uniqueness of the Ikarians, people who chose isolation and preserved special ethics, customs and a lingual idiom much different to the other people of the Archipelago.